AT A GLANCE: Funky picnic style eatery surrounded by smokers, authentic BBQ, they cook to capacity and when it's gone they close. Best BBQ in San Diego, hands down. This is it. Do not be afraid. Instead, rejoice! I'm picky when it comes to BBQ. Perhaps it's because in my former life I traveled to Kansas City a lot and got to taste the real deal. After a plate of burnt ends or smokey St Louis ribs it was always hard to come back to San Diego. Fish tacos we nail, BBQ was more elusive. But that has all changed with the opening of the Grand Ole BBQ y Asado in North Park. Grand Ole BBQ y Asado at first looks a bit, well, temporary, but don't let that scare you off. Real BBQ is all about the food and let's face it, San Diego can use a little more Portland in it's style. The menu changes depending on what they have cooked that day. Oh the smoke, so delightful and delicious, I knew this was going to be good from down the block. There are sandwiches (pulled pork, brisket, etc), of course, but you can also order by the pound and that's what I recommend. The day I was there the meats were going for around $18 a pound so get a half pound of whatever looks good and add a few ribs - you can tell them how many you want and they'll weigh them out. Beans, pulled pork, more beans (my wife loves them), smoked turkey, cole slaw, potato salad, and pork ribs - and yes, white bread! Pulled Pork: Slightly smokey, tender, juicy, just aching for a bit of Carolina vinegar sauce which is on the side the way it should be. I'd like a bit more smoke so I'll give it a B+. And yes, for you sauce fans there are plenty of options from sweet to spicy, Texas to Carolina, and they are all very, very good. I also like that you can grab a complimentary pile of pickles or pickled onions or jalapenos to kick it all up. And sure, get a shirt to show San Diego you know good BBQ! Yes, best ribs in San Diego! OK, the close up! Don't you love it that's not all smothered in sauce? White bread included so you can make your own sandwich if you want. Smoking up some Beef Ribs at Grand Ole BBQ. At the end I was so impressed I asked to see what was in the smoker and he opened it up to show me the Texas Beef Short Ribs. Oh my, I wanted them so bad but they needed a few more hours on the smoker so come back at 6. Dang! The menu changes from lunch to dinner and Sunday's there's an Argentinian menu with skirt steak and chorizo and even blood sausage (don't cringe, it's really good). 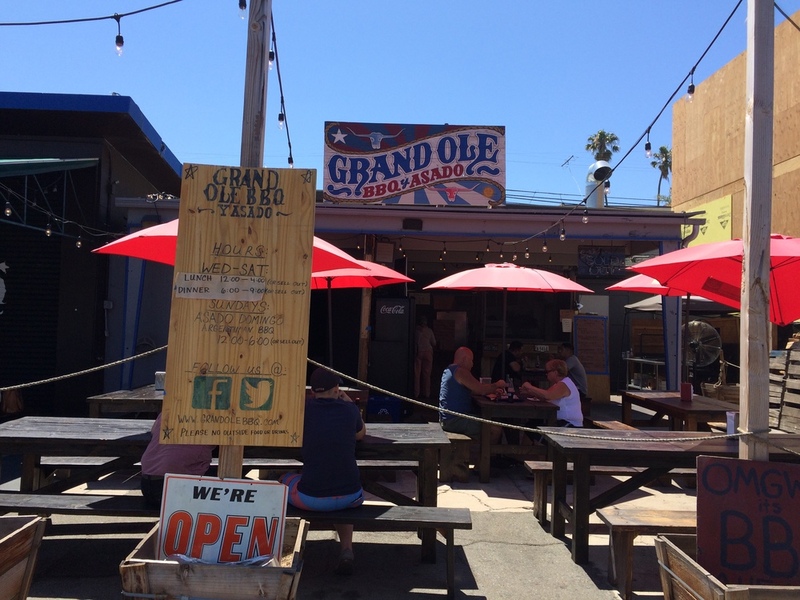 I haven't tried everything but what I had I loved enough to tell you to get yourself over to Grand Ole BBQ and be ready to experience San Diego's best BBQ. SUMMARY: Grand Old BBQ is to Barbecue as Las Quatros Milpas is to Tacos. It's San Diego's most authentic BBQ joint and a must taste to believe experience for anyone who loves smoked meats and a funky fun dining experience.